Laddu/ Laadu / Unde is one of the healthy sweet done and stored for munching at any time of the day. Here are some laddu which I prepared for distributing it for our relatives with Kashi Tirtha. We had been to Kashi/Varanashi , Gaya, Ayodhya and Prayag Rajya. It was beautiful trip with our friends and always cherish the memory. Visiting Kashi Vishwanatha temple is one such moment and taking dip in Ganga River and other holy rivers really an awesome feeling. Ok it is left to people with believers and non believers any ways. One has to enjoy his or her feelings and cherish the moment that he or she gone through. Coming back to Laddu, I have prepared this type of laddu using corn flakes and ground nuts, for Our Kashi tour and distributed among us in the bus while travelling to Gaya from Varanashi. I have done that laddu on Facebook live too. It is an easy, healthy, quick and simple to prepare and you can enjoy it any time of the day. Here I used almonds instead of groundnuts. 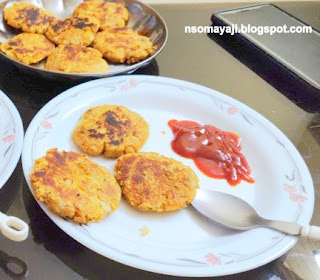 The ingredients I used are mainly Corn flakes, almonds, jaggery. Thats it.Minimum ingredients and healthy laddu to be munched. It stays for a week or little more days and it and no coconut used here. 2. Dry Grind almonds /badami in to rava consistency and shift it to a bowl. 3. Mix both the powdered almonds and corn flakes and keep it aside. 4. Take a big pan and keep it on a fire. Add powdered jaggery and 1/4 Cup of water. 5. Let it dissolve completely. Sieve it and keep it aside. 6. Now take cleaned jaggery and put it to a pan. Keep it on the fire and let it boil. 7. Stir in between and let it get one string consistency. Let it be on low flame. (Whole procedure). 8. Add powdered almonds - cornflakes mix and mix it well. 9. Take away the pan from fire and keep it down. 10. Put 3 to 4 tablespoons of ghee and mix it nicely. 11. Take a small portion from it and prepare laddu. 12. If you find the laddu mixture dry add 2 tablespoons of hot milk and mix it well. 13. You can easily prepare laddu. Prepare laddu with remaining mixture. 14. Let it completely cool. Store in air tight box or bottle. Check with one string consistency. Do not add more water. It takes long time to get thick. Do it on low flame. Adding ghee more /less is optional. Adding more ghee taste better. 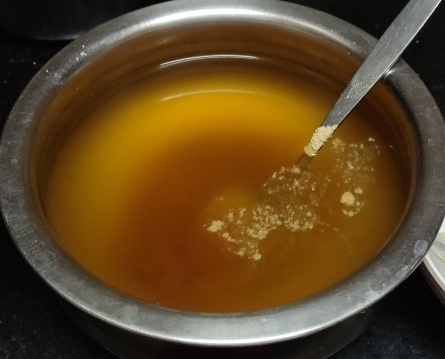 You can add ghee instead of hot milk if the mixture turns dry. Heat the ghee and then use it. 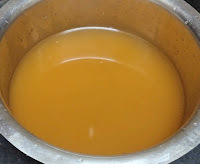 It is always better to clean jaggery and then use it. 25 to 30 Laddus can be prepared. (The size must be small). 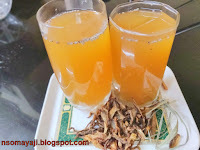 I have tried a juice with lemon grass used bimbli/ bilimbi with jaggery. The juice is so yummy and I thought I should share it here. Bimbli is a fruit which is used widely in South Canara. 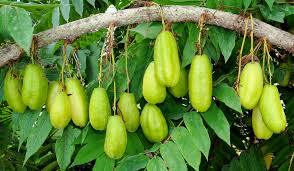 It is very sour taste and people use it for preparing pickle or use it cooking instead of tamarind or lemon. 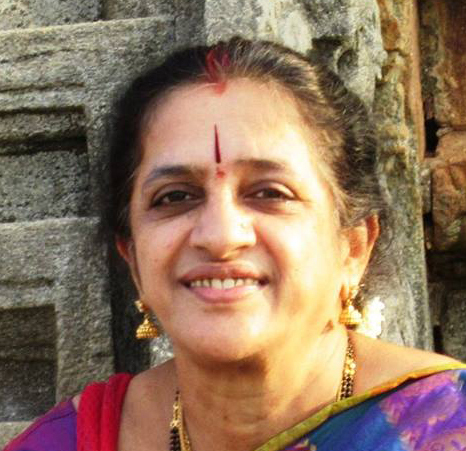 Bimbli is commonly known as bilimbi or Averrhoa bilimbi. Let us see some benefits of having Bimbli in our diet. 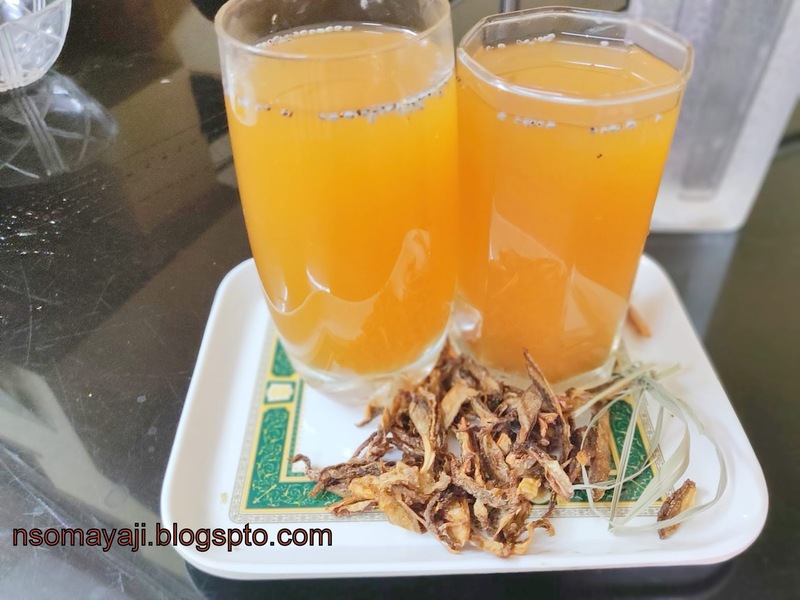 Bimbli /Bilimbi is a sour fruit which has natural sour taste. It is full of Vitamin B, Vitamin C, Iron, phosphorus and antioxidants. They help in curing cough, itches, pimples and skin irritations.They help to fight cholesterol and inflammation. It is rich in anti diabetic and anti- bacterial properties. 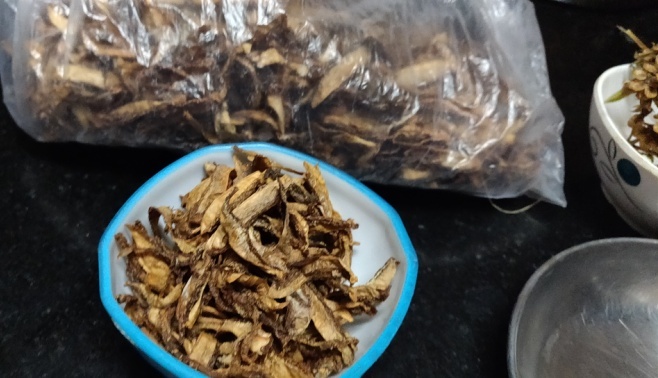 Bimli is used in cooking varieties of dishes. It is one of the favourite fruit of many people. 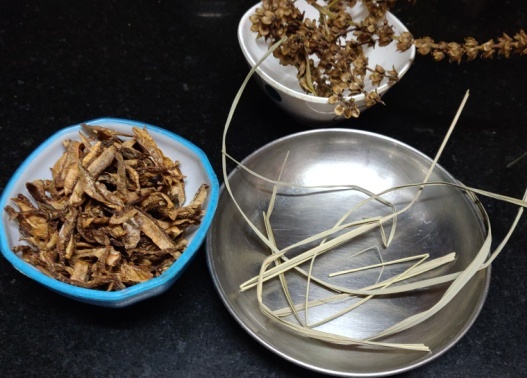 I have used Dry Lemon Grass, Dry Bimbli which I got from Subramanya Kordale and his wife Ragini. They do have a Bimbli tree in their garden and they dried the fruit and brought it. 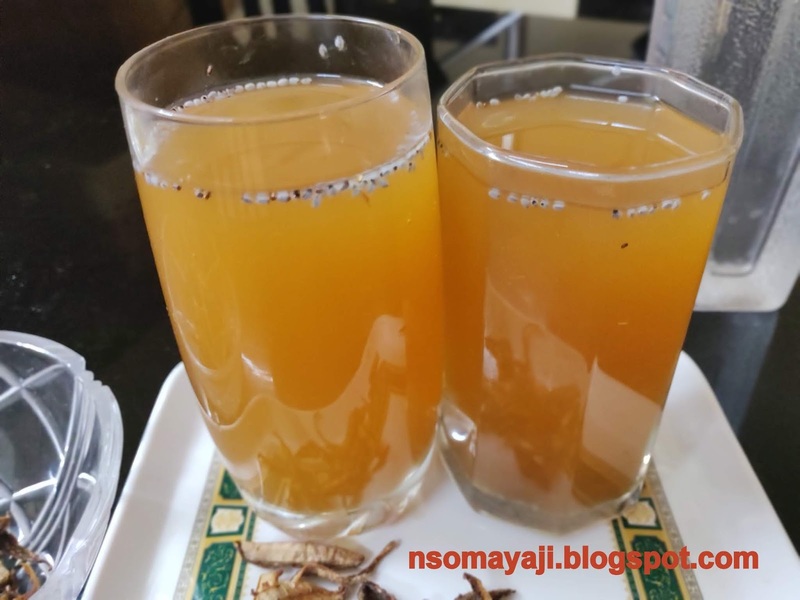 This Juice recipe started after seeing Sadashiva Rao Mailankody's post, Majjige hullina Panaka in Foodie blog. He is the admini for that blog and do try varieties of food and put it. 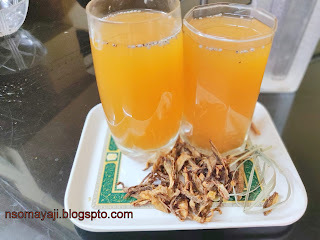 The lemon grass juice had the green mirchi and lemon. It is a spicy one of course. 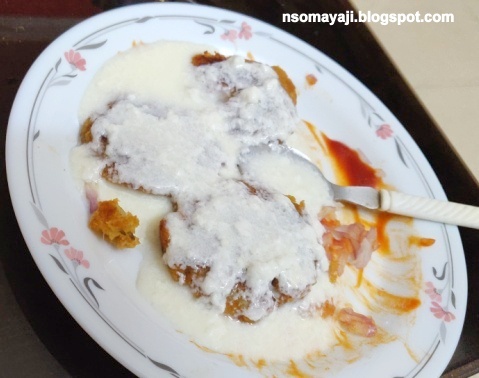 After seeing the post actually I wanted to try the sweet version using jaggery. But some how after remembering this dried bimbli I thought of using bimbli instead of lemon. That the way Bimbli - Lemon Grass Juice arrived. The bimbli's savoury taste and jaggery's sweet taste mixes well and gives out yummy taste. It can be relished so well and helps you to keep your mind and body cool. 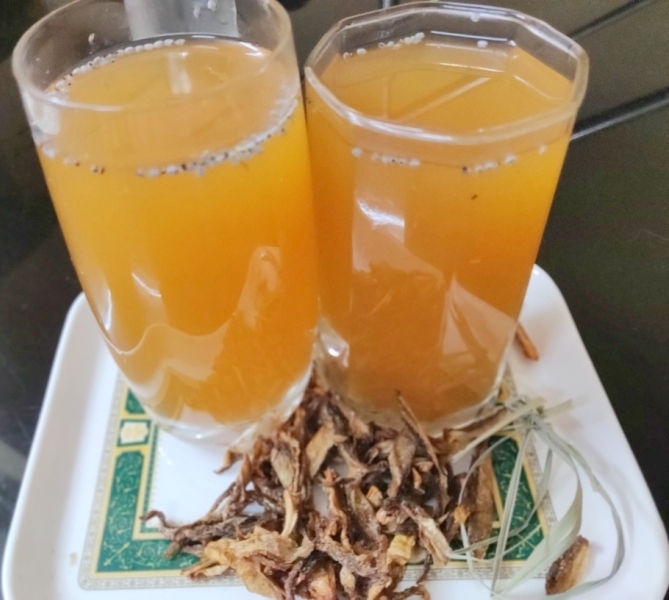 Dry Lemon Grass : One handful : 4 to 5 sticks. Dried Ginger : 1/2 Tsp. 1. 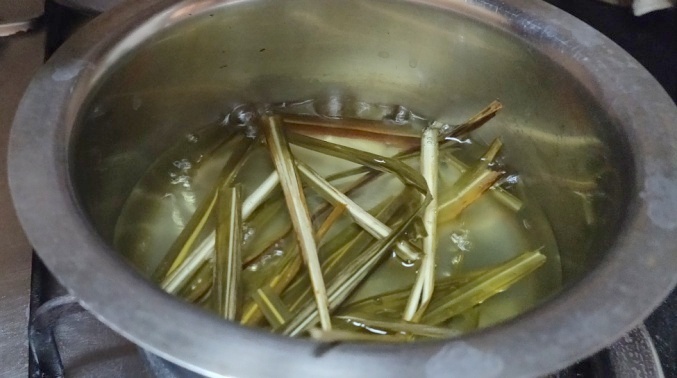 Wash and boil lemon grass in 1 cup of water for 6 to 8 minutes. Let it cool. Sieve it in a strainer. Keep it aside. 2. 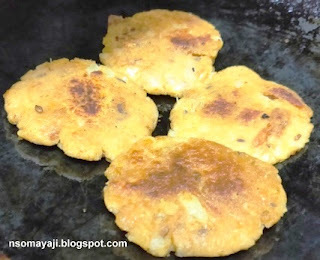 Wash and soak bimbli in hot water for 10 minutes and Grind it till paste. 3. 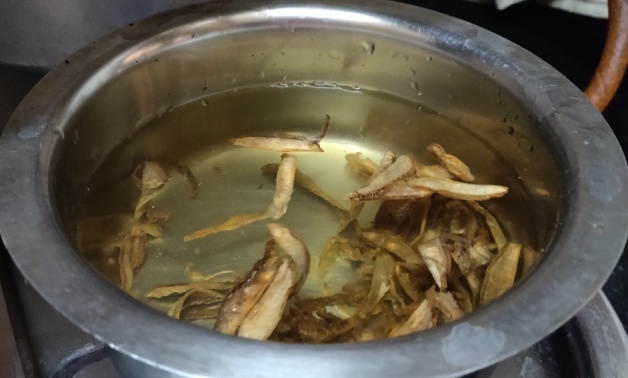 Now put cooled lemon grass water in a big bowl. Add jaggery and ground bimbli mixture. 4. Add dry ginger and salt. Mix all the ingredients nicely. Add 2 to 3 glasses of water. 5. 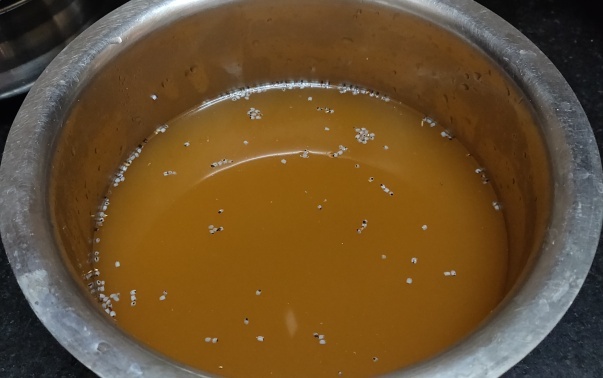 Let jaggery dissolve nicely in that mixture. Stir nicely and sieve this panaka to a separate bowl. 5. Bimbli - Lemon Grass Panaka is ready to serve. Pour Panaka to glasses. Adding Ice cubes is optional. 6. 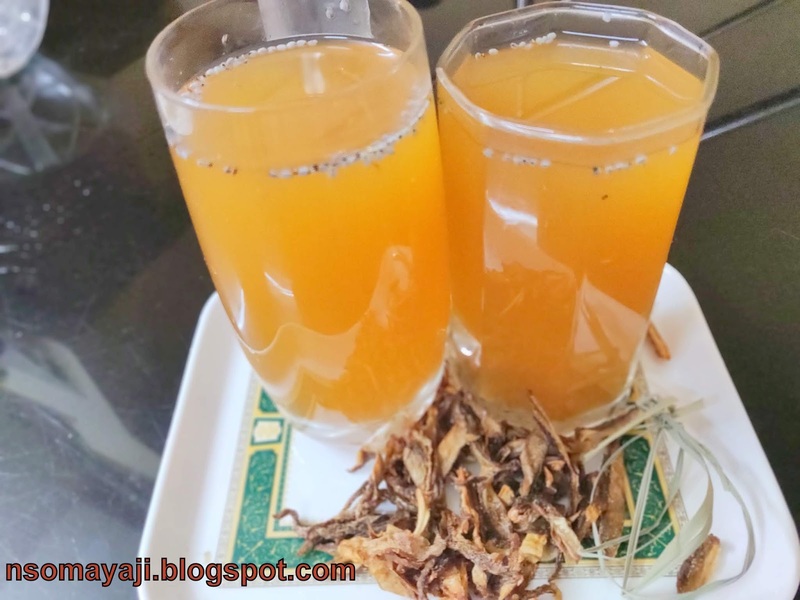 Serve Bimbli - Lemon Grass Panaka. Soaking bimbli in hot water helps the bimbli to get soft. Let it cool then you grind it. Use as you like. (Quantity). Use of jaggery /sugar/honey is optional. Fresh bimbli fruits can be used and fresh lemon grass too. Adding ginger helps to avoid cold. You can use crushed pepper pods instead of ginger. Check the taste and add water according to your taste. Adjust sour and sweet. 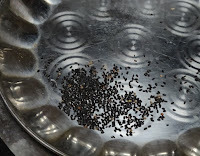 I added 1/2 tsp of Kamakasturi seeds which is grown in our garden. Time : 15 to 20 Minutes. Serves : 3 to 4 Glasses.